THE FRENCH HUTCH: WHAT’S FOR DINNER? Spring has arrived in all its glory but with it came a few scattered cold rainy days. On one of those evenings recently I needed to make an easy and quick dinner. First it has to be healthy, since we really are trying to eat healthy and of course something delicious. My recipe for rosemary chicken was the perfect choice. I served it with a baked potato with low fat toppings and to replace bread and salad I made my favorite bruschetta recipe. 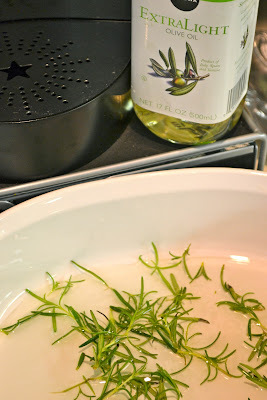 I love to make and keep rosemary infused olive oil. It is great to place on the island with a warm crusty bread for dinner guests to enjoy along with a glass of wine while dinner is being prepared. I was out I so I used olive oil with fresh rosemary from my herb garden. Add your favorite seasonings. I use Mrs. Dash Salt-Free Original blend. Let sit covered in refrigerator until ready to go into oven. Transfer chicken to your favorite baking pan and bake in preheated 350 degree oven for twenty minutes. Turn oven down to 325 and continue to bake until chicken is brown and cooked through. Cover and let sit until ready to serve. What could be easier than baked chicken. No guilt here! If you are still here hope you will leave a comment so I will know you stopped by. Oh this looks delicious. I'm going to be copying this recipe because I like easy and good. Since we eat a lot of chicken, I'm always on the lookout for new ideas. Oh my gosh it all looks soooooo good! Mmmm, this looks really nice! Looks delicious! Nothing better than cooking with fresh herbs! Looks delish and fast and healthy too. My kind of recipe. Thanks for sharing it. Looks Delicous! Definitel going to try! Found you on Savvy Southern Link party! Your bruschetta with cherry tomatoes looks so delish, and I love chicken, especially rosemary chicken. Great post, Emily! Are y'all enjoying your gorgeous patio for dinner these days? I'm going to spray off the deck so we can enjoy dinner al fresco tonight. Looks so yummy! You've cooked that chicken to perfection! Thanks so much for the recipe, fresh rosemary is just divine! It looks so delicious. I can't wait to try it out. I don't cook at all and my family likes it that way. But I think even I could follow your recipe. 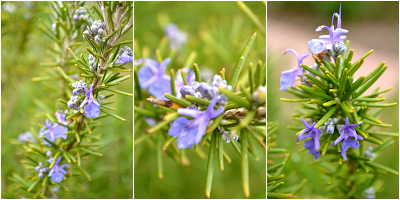 I love the flavour of rosemary, it must be a perfect chicken recipe for me! This sounds like a perfect meal, Emily! Thanks for sharing this easy and delicious preparation. It looks delicious, Emily! I grow rosemary plants every spring as I love the flavor. Oh yes, another recipe that I can use my Rosemary. I love cooking with herbs and this looks delicious. I too love crusty bread with bruschetta. Thanks for sharing with SYC. Looks delicious...what isn't there to love with chicken and rosemary...thanks for sharing your recipe, Emily. Here I am having breakfast yet craving chicken now! That looks so good! This looks wonderful, Emily! Thanks for sharing this recipe at the Open House Party. It's so nice and brown with no effort. I love easy oven dinners. Thanks. YUMMY!! I love rosemary, and I also like to keep several herbs in oil which I call green sauce. I typically make a jar of parsley with garlic, a jar of cilantro, and a jar of rosemary. It's so good, healthy, and makes cooking simpler since you have a marinade and a base sauce made ahead. I needed a new recipe because I am in a rut. Thanks, I plan to make your rosemary chicken. So, do you bake with the lid on? That is a nice baking dish. Loved your gardens in Holland post too. I know heaven is glorious. I am so glad you shared your feelings of feeling a touch of heaven. Your music is glorious also.